You likely take your vehicle in to get it serviced at recommended intervals to ensure that it runs properly. If a misaligned car isn’t fixed your engine could blow, or your transmission could require replacement. Chiropractic care is similar in that minor repairs to the body can help avoid major problems down the road. This form of natural health care can help the body heal itself better. Your body may be trying to heal, but if you have interference in your spine and nervous system it won’t be able to. Once you remove the interference, your body can function optimally. 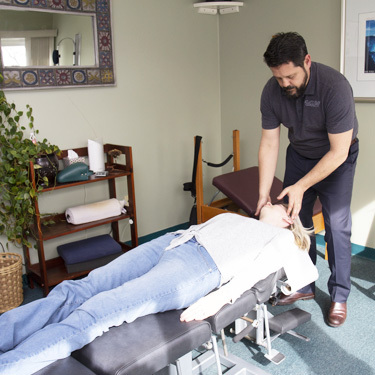 One of the most common things that Dr. Green hears from patients is that their body feels lighter after they get adjusted. If you have a door that’s on poorly aligned hinges, it doesn’t move easily, and it feels heavy. It’s not heavy but just misaligned. When you realign the hinges, it swings easily like it’s supposed to. It’s not as heavy as it was. Chiropractic care also reduces pain, improves motion and promotes better sleep. The body wants to repair itself when under care. Chiropractic BioPhysics® (CBP®) : This technique is focused on producing improved posture, balance, spinal alignment and restoration of essential spinal curves. With CBP, Dr. Green looks at a patient’s posture before and after every adjustment. Directional Non-Force Technique : This low-force technique doesn’t involve any popping or cracking, so it puts a lot of patients at ease. Extension Traction : With this technique, the soft tissues of the spine are stretched. The goal is to allow the spine to return to a more normal posture. Extremities : While many health problems can be traced to the spine, wrists, elbows, shoulders, knees and other joints of the body can be helped. Thompson Drop : This technique uses a particular table that reduces the amount of energy needed to adjust your spine. Experience firsthand the incredible difference that drug-free chiropractic care could make in your life. Contact us today to schedule an appointment!